The years 2016 and 2017 have seen a lot of groundwork being done on legislation concerning the conservation of wetlands in India. Last year, the Draft Wetland (Conservation and Management) Rules, 2016, were presented to the public for comments. These rules were to replace the Wetland (Conservation and Management) Rules, 2010. In February this year, the Supreme Court directed the central government to identify and inventorise over 200,000 wetlands in India besides notifying the 2016 Rules on or before June 30. When the government did not meet the deadline, the apex court slapped Rs 50,000 as costs on the Union Ministry of Environment, Forest & Climate Change. All this speaks a lot about official attitudes in the country towards wetlands. That attitude could be the reason why an ecological crisis is unfolding in one of India’s most picturesque states. While it is famous for its beaches, arguably Goa’s most fascinating feature can be found slightly inland—the network of human-made agricultural lands and lakes that drain its nine major rivers and their 42 tributaries. This wetland system, that makes Goa habitable, is called Khazan. Khazan is an example of traditional engineering ingenuity. While there is uncertainty over its exact date of emergence, experts agree it is at least 1,000 years old. Goa has been largely built on reclaimed land. With about 50 per cent of it being less than 5 metres (m) above sea level, the meandering rivers and ingress of sea water along rivers can submerge substantial portions of the state if not for Khazan. 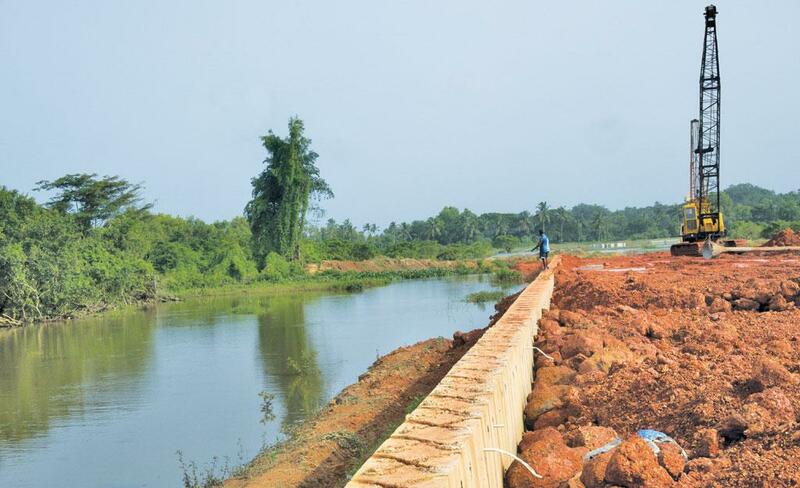 The system depends on carefully planned embankments (bundhs) built with mud and laterite stones, drainage canals and sluice gates that, along with estuaries and mangrove areas, limit tidal ingress and regulate the flow of rain and river water. Traditionally, sluice gates would function on pressure—opening and shutting according to the flow of the tides. Khazan lands terminate at the lowest level of the tide, at a depression called poim. This acts as a storage area for storm water and protects agricultural lands from high tides. Khazan lands are internally connected by crossdraining channels that ensure circulation and drainage. The system, though efficient, requires frequent maintenance. With Goa rapidly moving away from agriculture and fishing, and towards tourism, maintenance of the bundhs and sluice gates has not been given a priority. While its economic value is difficult to estimate, around 80,000 jobs and annual revenue up to Rs 150 crore depend on Khazan lands, according to a 2004 paper by Goa University’s Nandakumar Kamat. Yet, it isn’t the Khazans’ disrepair that threatens Goa the most. It is that Khazan lands are now being gobbled up for infrastructure development. The contribution of the construction sector to the state Gross Domestic Product has risen by a phenomenal 136 per cent—from Rs 1,313 crore to Rs 3098 crore between 2004 and 2014. This is twice the size of Goa’s agricultural economy. Moreover, the number of hotels in Goa has doubled between 1999 and 2016. “The beauty of Khazan engineering is that it is sustainable and reversible. It does not alter the hydrology, just manages it. If you leave Khazans for a few years, it transforms into mangroves. In contrast, modern construction is destructive and irreversible,” says Abhijit Prabhudesai, who works on wetland conservation in Goa. Rapid construction on Khazan lands and waterbodies is glaringly visible on the NH-66 (formerly NH-17) road-widening project that runs north-south through Goa and is expected to cut two hours of travel time from Mumbai to Goa. The Goan section is about 100 km long and has been exempted from any Environmental Impact Assessment (EIA) as per the 2006 EIA notification. Nuvem village, close to Margao, is currently bearing the brunt of this exemption. Here, concrete is being dumped into the adjoining Rumder lake for the construction of the western bypass. The 4-km stretch, just about 150 m from the main road, practically cuts through the lake and bifurcates the Sal river on which locals depend for agriculture and fishing. “Land acquisition was done without any consent, impact assessment or study of the hydro-logy. This road not only cuts through the lake, it impedes the flow of freshwater into the Sal’s catchment area. It has completely destroyed the region’s biodiversity and agriculture,” says Zarine da Cunha, a Nuvem resident. “Earthen bundhs and narrow roads are being replaced by wide built-up roads over 20m-wide. This is a disaster-in-the-making as it severely fragments a fragile eco-system. There is no distinction between marshy wetlands and Khazan lands from an aerial view; they form a single ecosystem, vital for several migratory and endangered species of birds. Fragmentation is bound to dry these lands and severely deplete the habitat,” explains Prabhudesai. Five of six talukas whose panchayat-level plans were reviewed by Down To Earth featured proposed roads on “No Development” zones including in the famous protected lake, Carambolim. In Durbhat village of Ponda taluka, pristine mangroves adjacent to the Zuari river are being hacked and filled for the construction of a 10 metre-wide road, in violation of the Coastal Regulation Zone regulations. The plan shows the road cutting through the mangrove forests for about a kilometre before meeting an existing road without any apparent reason. Activists allege that the road will serve as an approach to the mangrove forest on which a coal stacking yard has been planned. Incidentally, the Public Works Department identified Durbhat as a site for a new jetty just this February. “A big problem is that another 25 m-wide road is proposed barely 500 m further inland. Together, these roads will completely isolate the Khazan lands and natural cover from the river, destroying the hydrology,” explains Prabhudesai. “Khazan lands and mangroves are listed as eco-sensitive zones and are under protection from developmental activity. 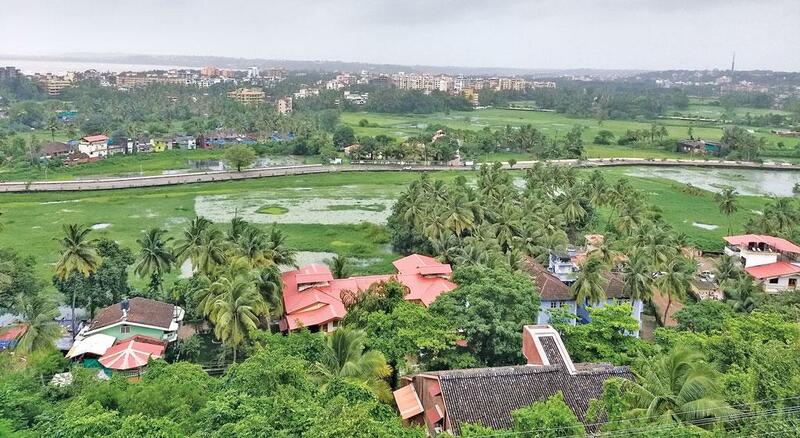 However, Goa’s unique geology and ecology necessitates some infrastructure development on such lands,” says S T Puttaraju, Chief Planner at the Town and Country Planning Department, an approving authority. “Less intrusive methods like stilts, which are less destructive, should be pursued but these are more expensive,” he adds. While Puttaraju claims economics dictates decision-making, there isn’t much evidence of this. Economic data pertaining to Khazan lands is practically non-existent. There was no response from the state revenue minister’s office despite multiple attempts to reach him. Similarly, no official estimates of the economic value of the ecological services are publicly available. As far as wetlands are concerned, the government is yet to even come up with an inventory, let alone any estimation of the economic value. Arguably, the most important consideration in Goa’s low-lying areas is water regulation. 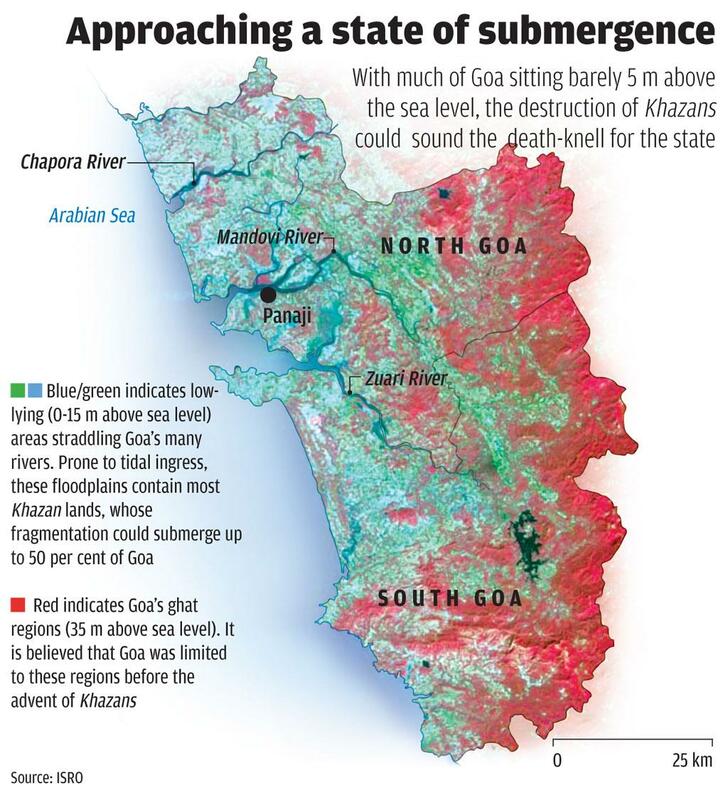 With vast Khazan lands to bank on, Goa had rarely seen major flooding events despite over 3,000 mm of rains annually. According to the Central Water Commission’s flood damage data, floods were practically unknown in Goa until the late-1990s. But in the past decade, they have started to become an annual affair with increasing damage. Despite their importance, there is little legal protection for Khazan lands. “Wetland” is an ambiguous term in Goa. While these lands fit the wetland profile as put in the 2010 and 2016 Rules, they have been kept out of the Rules’ purview due to their agricultural value. Because of this ambiguity, both the Centre and state governments have failed to monitor and protect these lands. Mandated by the 2010 Rules, the Goa State Wetland Authority (GSWA) was created in August 2016, and in May 2017, Chief Minister Manohar Parrikar vowed to complete the wetland inventory for Goa as a priority. However, till date, there has reportedly been only one meeting of GSWA members. “The atlas for one taluka has been prepared. We are waiting for funds and the go-ahead from authorities to prepare others,” says Puttaraju, who has been involved in preparing the inventory. Moreover, the 2016 Rules have compromised the GSWA’s power. “The 2016 Draft Rules are a watered-down version of the 2010 Rules. The power of the wetland authority (as mandated in the 2010 Rules) to include wetlands suo moto or based on individual applications has been removed in the 2016 Rules,” says Terence Jorge, who works with the EIA Resource and Response Centre in Goa. The state has passed no legislation to protect Khazan lands either. While a Khazan management authority has been demanded since the early 1990s, a draft version of the Goa Khazan Land Development Board Act was issued only in late 2012. It could not be passed following objections by environmentalists that the bill would have more to do with Khazan redevelopment rather than protection. The result of all this could be disastrous for the paradise that is Goa. “The way it is headed, Goa will cease to exist by the end of the century,” says a GSWA member who requested anonymity. This story was first published in the August 15-30, 2017 issue of Down To Earth magazine under the headline "Road to nowhere".